Crafted of sterling silver and 18K yellow gold, this bangle bracelet features an intricate two-tone design. 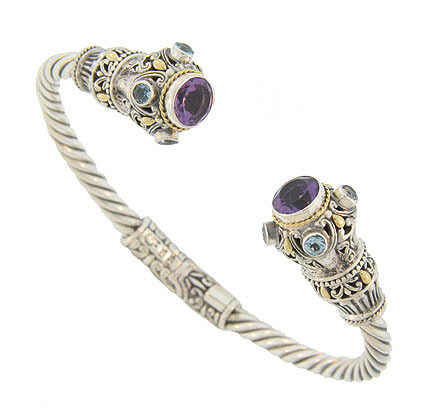 The bracelet is adorned with elegant scroll work, yellow gold milgrain, round cut blue topaz and finished with deep purple amethyst. 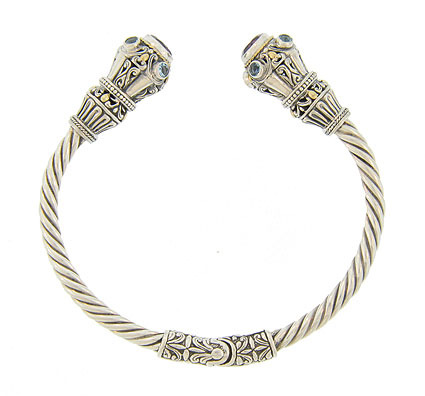 The open shaped cuff is crafted of twisting braids, while the hinge is decorated with additional scroll work design. The bracelet measures 3/8" in width and features an internal spring so the cuff bracelet can be easily slipped over a wrist. The interior of this cuff is approximately 6".